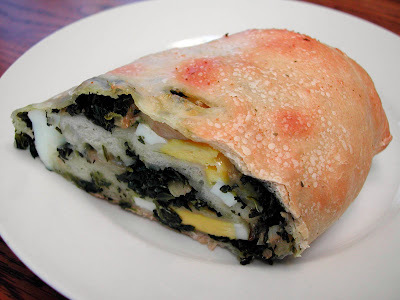 I LOVE SPINACH PIES... Especially ones with roasted fennel and olives... and eggs! Yes EGGS! It may sound weird but let me tell you, it is awesome. 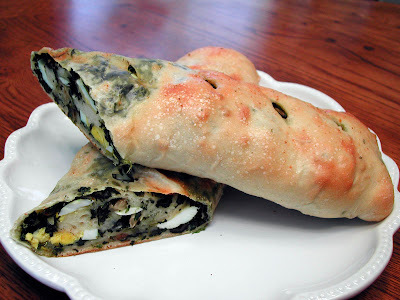 The eggs not only give great flavor to this calzone, but also add a great amount of protein to this otherwise protein lacking loaf! A friend of mine (Joann) actually turned me on to this idea. I guess it is a common addition in Italy, where eggs are added in many unsuspecting dishes. 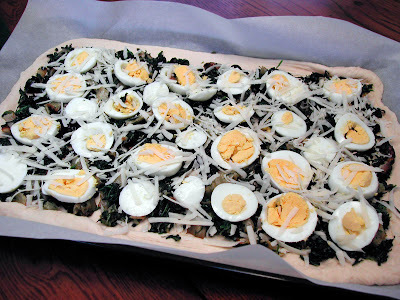 If you don't like eggs then by all means leave them out, because the roasted fennel and olives, along with the sauteed spinach, would certainly give this loaf enough flavor on their own. Line a baking sheet with aluminum foil. Add the fennel and olives and toss with 2 tablespoons olive oil. Season with salt and pepper. Bake for about 45 - 55 minutes until fennel is soft and caramelized. Remove from oven and set aside. In a large frying pan, heat 1 tablespoon of oil. Add the garlic and sauté until soft. Add the spinach and sauté for 2 to 3 minutes. Add the basil, parsley, salt, pepper and seasoning blend and cook for 2 to 3 minutes more. Remove the mixture to a bowl and add in the fennel olive mixture. Mix well. Turn the dough out onto a floured surface, and roll it out to a 12 x 14-inch rectangle. 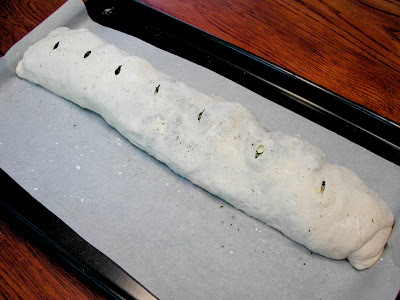 Lift the dough onto a parchment lined or lightly greased baking sheet. Brush the top of the dough with the remaining 1 tablespoon olive oil. Spread the spinach mixture over the dough. Leave about a 1/2 border. Add the egg slices and cheeses, covering the entire area evenly. Roll the long side of the dough up like a jelly roll. Pinch the seam and the 2 ends to seal, making sure the seam is on the bottom. Brush the top with the egg wash or milk and sprinkle with the seasoning blend. Slice several small slits in the top of the dough for the steam to vent. Place in the 400°F oven. Bake for 25 to 30 minutes, or until golden brown. Let cool for 5-10 minutes and cut on a diagonal for best presentation. Oh, WOW! That looks and sounds great. I appreciate all of the wonderful flavors you've used. I like the egg idea. I'm pro egg. I've been eating more lately to boost the amount of protein I eat. People give you a hard time about eating eggs though. At least in this house. Cool combination for the filling. We made calzones too this weekend, but ours were more boring - turkey pepperoni, mushroom and tomatos. Also given your blog name and header I would like to tempt you into participating at a foodie roundup event. The current theme is springtime salads.What do you say? Also if you have any theme suggestions I would be happy to hear them too.